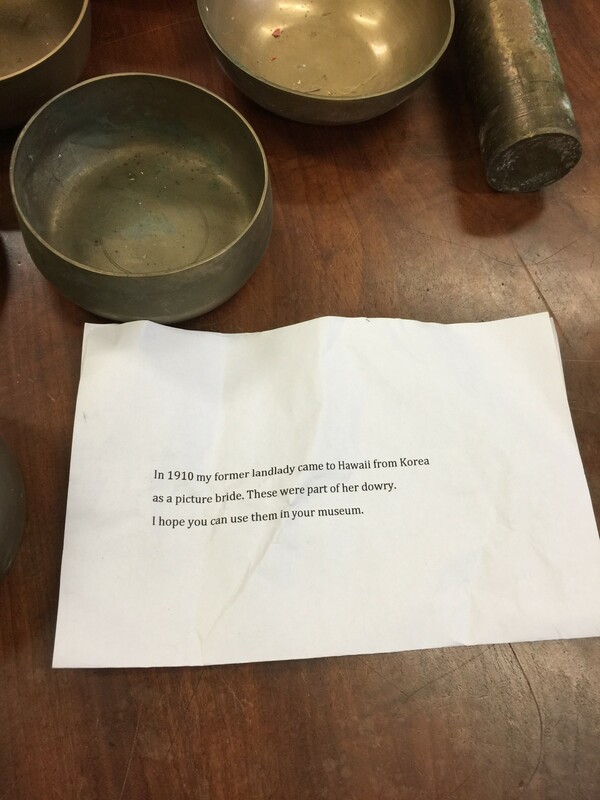 Recently the museum received a mysterious package literally addressed to the “Korean Room,” aka our Korean Gallery. The nondescript cardboard box lacked a return address and only listed a P.O. box on the Big Island. 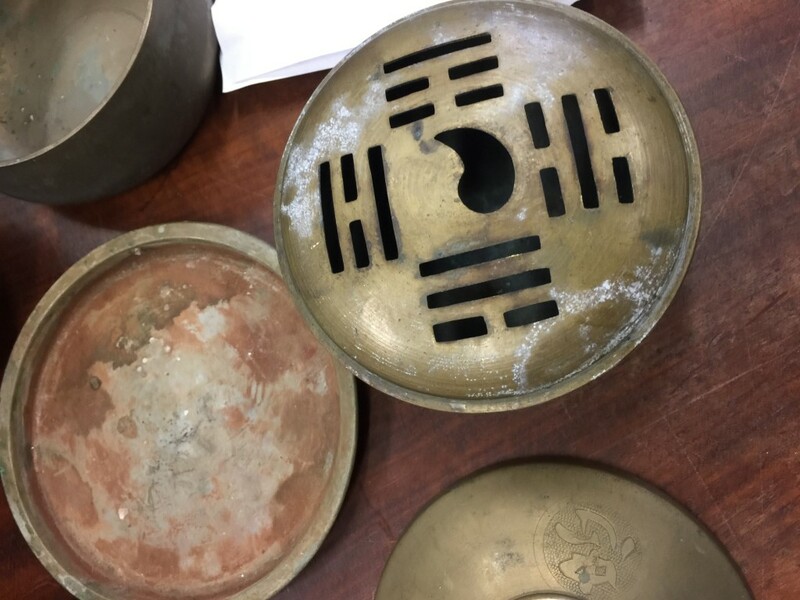 Inside the anonymous box was a brassware set that belonged to a picture bride who came from Korea to Hawaʻi in the early 20th century. This kind of set was used for ancestral rites and features motifs of i-ching hexagrams and bats, which mean good luck. Strangely enough, it seemed like one item was produced in Turkey. The bowls, used for ceremonial purposes, featured Korean flag symbols. It gets more intriguing. The box also included a brief letter that said: “In 1910, my former landlady came to Hawaiʻi from Korea as a picture bride. These were part of her dowry. I hope you can use them in your museum.” The donor and bride remained anonymous. An anonymous donor wrote a succinct note in the package. Our collections team determined that the set was not suitable for the museum’s collection but was unsure of what to do with it. After much researching, the library’s Ellie Kim learned of the Museum of Korea Emigration History’s collection of artifacts relating to picture brides. So our registrar, Pauline Sugino, reached out to the Incheon, Korea-based institution to offer transferring them the brassware set. Now the brassware set can live on as a snapshot of history that pertains to both Korea and the islands. 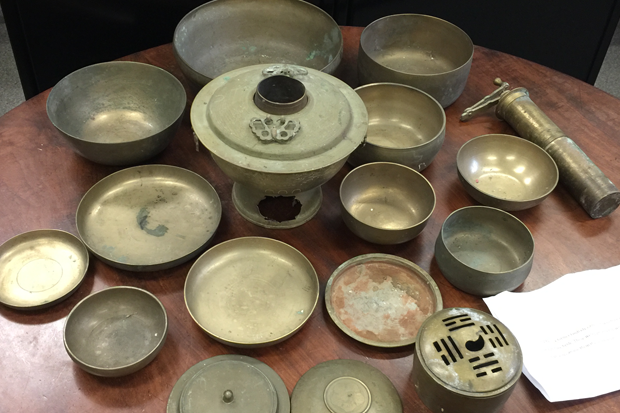 What a great collection of Korean brass work from more than 100 years ago. The piece with the yin and yang symbol however being identified as the Korean flag is interesting. The yin and yang with the trigrams around it go back to early Taoist imagery. Korea adopted the combined symbols for their national flag in 1882. A Korean ambassador on a mission to Japan was ordered by his government to fly a unique flag to signal that Korea was a sovereign nation. He was sailing on a British ship and showed the ship’s captain a drawing of a previously approved drawing of a flag he had brought with him. He asked if they could make a flag for him before arrival in Japan. The drawing showed 8 trigrams. The captain said it would be less confusing for his sailor if there were only 4 trigrams. So today, the national flag os South Korea has 4 not 8 trigrams, thanks to the Royal Navy. It’s a good thing that Betsy Ross could handle 13 stars and that she didn’t have to do what some British Officer told her. Go Navy – Beat Army!